With the hot, record-breaking temperatures in the Phoenix area, the summer getaway in the White Mountains seemed to be the place to travel. The Robson Ranch Sandstorm softball team did just that! 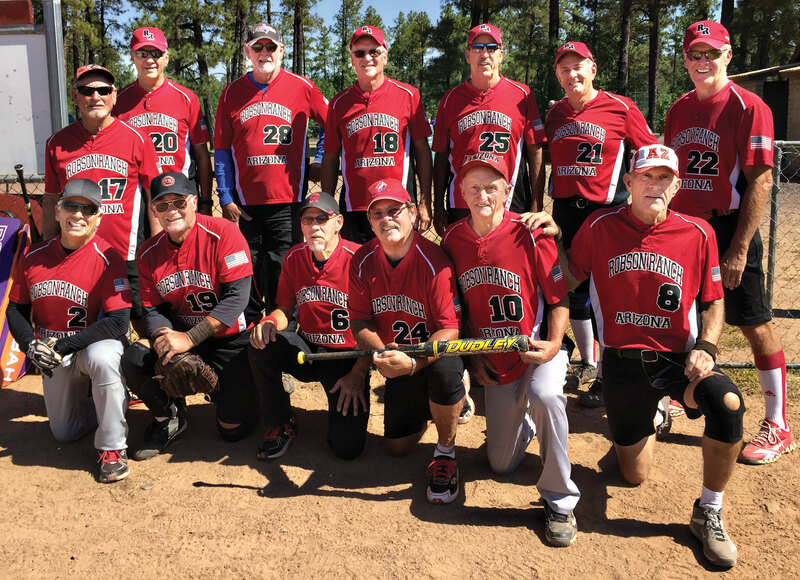 The team competed in the Summer Softball Tournament in Pinetop at the end of June. Six teams were competing in the same division as the Robson Ranch Sandstorm. The teams came from Goodyear, Tucson, Payson and Mesa, Arizona, as well as Albuquerque, New Mexico, and all were equally well matched! The Sandstorm played two excellent games the first day of competition. The guys were hitting well and playing great defense. Although they handily defeated the first team they faced, the second game proved to be more competitive. Luckily Sandstorm won that game, too. Now the team was 2-0, and it was time to play two additional teams. Once again the batters were hitting well and scoring runs. Defense was definitely needed as these two teams played tough games. At the end of the morning, the strong Robson Ranch Sandstorm was 4-0; one of two undefeated teams in the league. Tomorrow would be the determining factor—single game elimination for the championship. The two undefeated teams earned a “bye” for the first match of the final day of competition. Taking the field to an already pumped up team who had just squeaked out a win in their first game, Sandstorm soon found out how tough this game would be. At the top of the seventh inning the guys needed to score two runs to tie, three runs to go ahead. Unfortunately the Goodyear team was too much for them. Even though they lost the last game, The Robson Ranch Sandstorm had an excellent tournament—4-1! Way to go, Robson! Thanks go to John Sutton, the official scorekeeper, and to Dave Rinaldo who worked tirelessly getting the player commitments for the roster as well as managing the team.